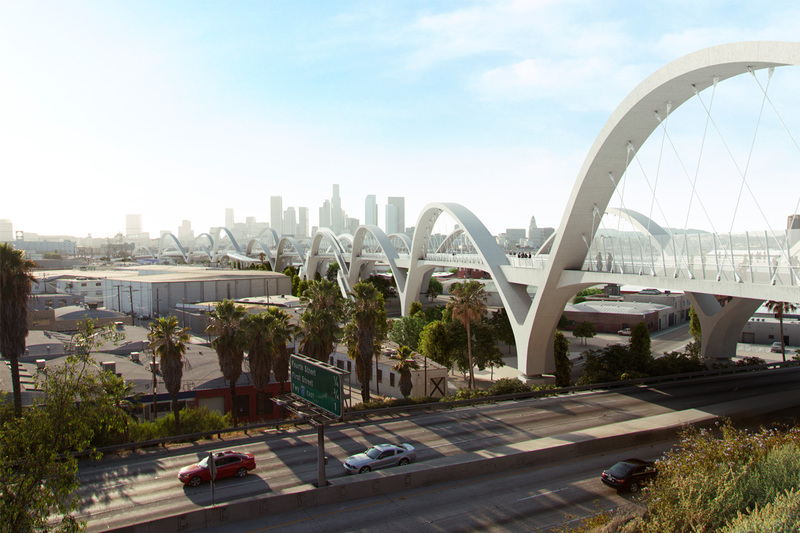 A heroic new flyover video from the team behind the new Sixth Street Viaduct project in Downtown Los Angeles gives us a closer glimpse into what is in store for the L.A. River–spanning bridge as work on the $482 million project moves toward its 2020 completion date. Construction on the bridge—designed by Los Angeles–based Michael Maltzan Architecture (MMA), engineers HNTB, and the City of Los Angeles Bureau of Engineering—is well underway. Skanska and Stacy and Witbeck are contractors for the 3,500-foot-long project. The original 1932 expanse was demolished last year as a result of long-term and irreparable structural issues. MMA’s proposal for the bridge was selected in 2012 after the city held an international contest to design the new monument. This summer, workers on either bank of the river are preparing foundations for the first of ten pairs of arching piers that will eventually support the bridge. The flyover video shows four lanes of conventional automobile traffic running at the center of the bridge, with striped bicycle lanes and barricaded sidewalks on either end. Either end of the bridge is anchored by large-scale pedestrian access ramps that wind up to meet the bridge structure. The ramps on the Boyle Heights end of the bridge wind in a circular path that ramps down to meet the neighborhood and forthcoming landscaping and park areas, part of the $12 million plan to pedestrianize and green the areas below and around the bridge. Overall, the bridge will feature five pedestrian stairways and at least three ADA-accessible pedestrian ramps. The video has drawn a bit of criticism on social media from bicycle advocates for not including protected bicycle lanes in the design. Los Angeles is making an earnest push to expand its network of protected bicycle lanes in conjunction with the piecemeal introduction of a regional bikeshare system and a growing focus on Vision Zero street designs that minimize pedestrian deaths. 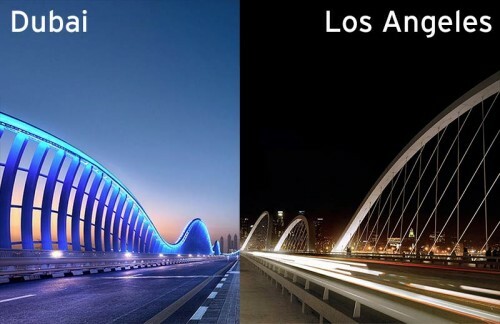 Instead of embracing this growing design trend, the new Sixth Street Viaduct designs, like the recently-completed Riverside-Figueroa bridge, exhibits wide, automobile-centric proportions. The bridge is scheduled to finish construction and open for traffic in 2020. Celebrating a peculiar form preservation, Los Angeles City Councilmember José Huizar and the Los Angeles Bureau of Engineering will be teaming up on August 13th to host “Rock Day L.A.,” an event focused around handing out roughly 1,000 pieces of the iconic Sixth Street Bridge, currently under demolition. The event, held as part of the City's effort to keep the public engaged with the $449 million project, will feature live music and food as officials hand out free chunks of the structure on a first-come, first-served basis. Each piece will be accompanied by a certificate of authenticity. The event, hosted on a Saturday morning to ensure public access, will mark another milestone in the Sixth Street Bridge’s replacement, as crews have spent the last six months methodically deconstructing one of L.A.’s most iconic structures. 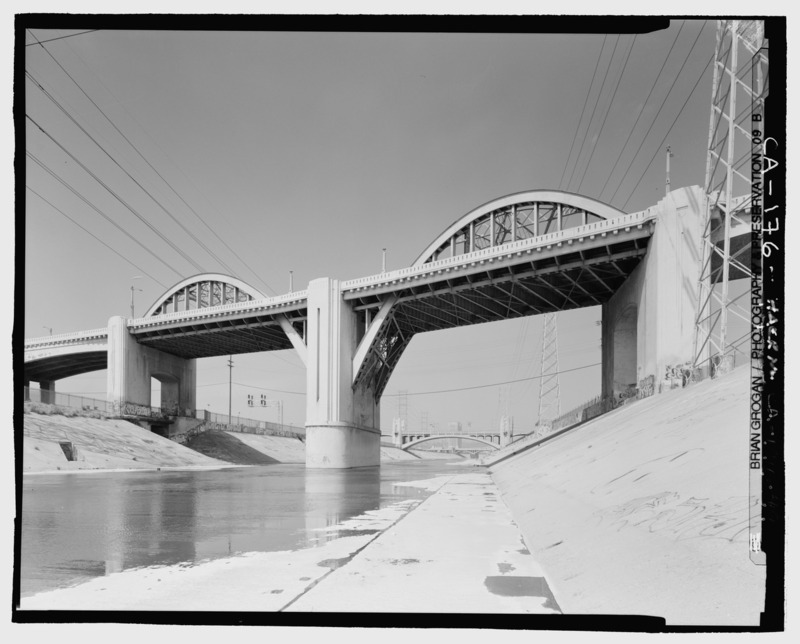 Built in 1932 using an innovative-for-the-time, on-site concrete manufacturing plant, the Sixth Street Bridge was eventually found to be suffering from Alkali-Silica Reaction (ASR), commonly referred to as "concrete cancer." ASR is a malady that occurs when concrete is made with too much alkali content, setting off a chemical reaction between that alkali content and the concrete’s aggregate, resulting in a gel-like substance that weakens the structure. This chemical byproduct creates stress within the concrete itself, resulting in a brittle material that, given L.A.’s seismically active history, has the potential to cause catastrophic failure. The bridge was designated as a public safety hazard in 2011 when the Bureau of Engineering estimated that there was a 70% chance the bridge could collapse in a major earthquake over the next 50 years. The following year, an international design competition was held afterward to design a replacement. 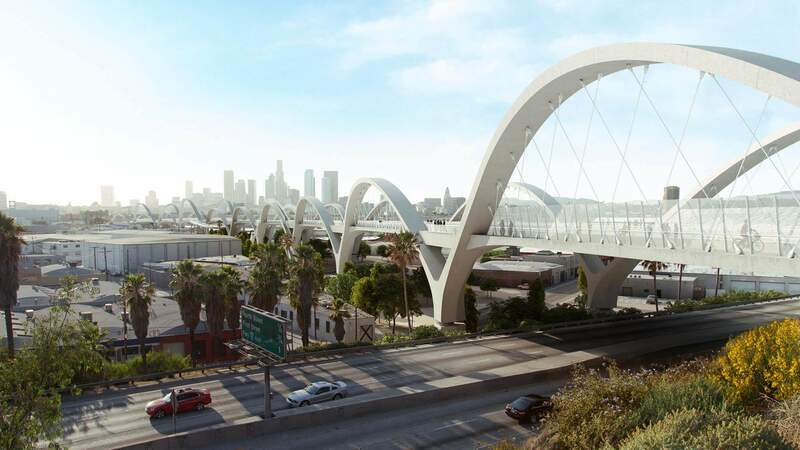 The Sixth Street Bridge will be replaced by a HNTB and Michael Maltzan Architecture-designed structure that evokes the Art Deco original with its cascade of swoopy, cable-stayed supports. The new structure, due to be finished in 2019, will feature an array of public parks, plazas, and connections to the city’s Los Angeles River, which is also currently undergoing radical change and restoration.